Happy Monday again, everybody! Oof, this Monday’s a tough one – all Mondays after holidays are, but this one’s tough since Christmas was such a lovely respite from the hustle and bustle and New Year’s is only two days away. So I thought I’d commemorate the last Monday of the year with an appropriate Monday Memo. I’m not going to do specific resolutions for this New Year’s – it almost seems like dooming yourself to failure when your expectations are so specific and so high. Instead, I’m going to take the saying above to heart. Eboni from The Fashionista Next Door included it in a post a little bit before Christmas, and it really struck home. Instead of listing 10 or so things I’d like to improve, I’m taking it to the crux of the matter: discipline. Ah. 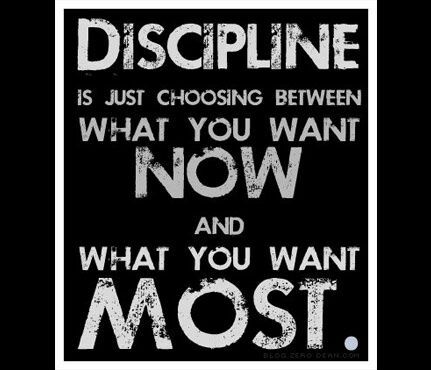 Discipline can be applied to everything, whether it’s something trivial like foregoing the chocolate cupcake at lunch so you can have wine with dinner or something more serious like holding tight to your wallet on the daily so that that big purchase (house, car, trip) can come true a little sooner. I think sometimes it’s easy to say “I just need to want less” or “I just need to say no more often”, but let’s face it, wanting and saying yes are things that come naturally more often than not. The idea, I think, then is to prioritize those wants so that the most important things don’t give way to the less important things. 2013 has been a hard year on so many levels, but we’re hopeful for the next one. We have big plans, both professional and personal, and we know that with a little discipline and prioritizing, we can slowly and surely work towards them. I hope your holidays were lovely, and here’s to a happy and healthy 2014.